Penguin God wrote: Also the tracing was incredibly obvious even if you didn't know where the references came from because the art would suddenly spike in ability even with the posing being wrong. I can't hate that artist totally though, as Bocoe and Decoe standing awkwardly as they set themselves on fire was possibly the funniest thing that book ever produced. I dunno, I seem to remember there being a shot in which Sonic ended up with three arms... might be the wrong kind of funny though. ToaArcan wrote: I really want to make a joke about Scourge here. In a topic about recolouring, it just seems all too appropriate. We had the board filter his name to "Captain Recolour" like two years ago, so you're a bit late. Kureejii Lea wrote: We had the board filter his name to "Captain Recolour" like two years ago, so you're a bit late. That's just too perfect. Hats off to you all. Oh gosh, I dunno if I even remember that XD It was so long ago. Penguin God wrote: I can't hate that artist totally though, as Bocoe and Decoe standing awkwardly as they set themselves on fire was possibly the funniest thing that book ever produced. These are all from the same issue; Sonic 92. In fairness, most of them look copied, rather than traced. ToaArcan wrote: In fairness, most of them look copied, rather than traced. Tracing would actually take more time than the "place existing image underneath and draw accordingly" method used in most of these examples. Higgins doesn't really deserve much hate for what happened with Sonic #92, though; the guy's an inker who got roped into providing "pencils" because someone else was too busy embezzling funds paying more attention to the upcoming Star Wars film commissioning self-congratulatory editorial comics slacking off to actually line up a pencil artist for the issue. To be fair, this happened during the era of hilariously bad art so it was hardly noticeable. This being a dark time where Steven Butler was by far the best regular pencilist and Spaz/Fry who are normally better were going through their hyper-anime phase. IIRC, he and Max were pretty much bigger villains than Eggman and the other bad guys during that period. Which is very noticeable too!! Did he got permission to do this trough? While the Sonic looks good its sort of sticks out like a pretty butterfly between mediocre flowers. Spaz did production work back then, fixing mistakes occasionally and sometimes redrawing things entirely. 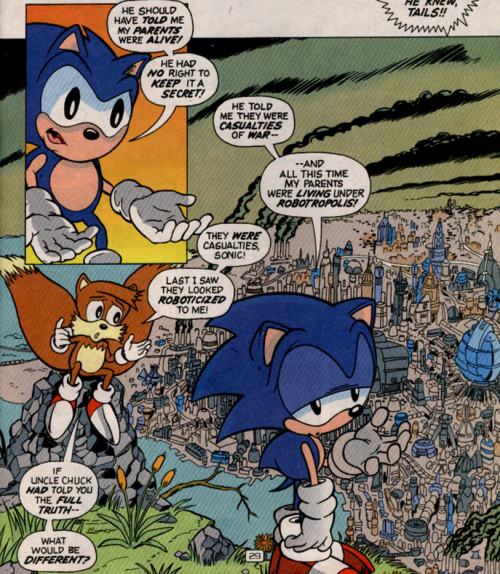 That particular Sonic was presumably drawn for that scene, or at the very least not previously used in the comics. Now, the rest of the issue is full of tracing, especially the backgrounds (which are mostly traced off SatAM backgrounds and panned shots). DudestofGuys wrote: Spaz did production work back then, fixing mistakes occasionally and sometimes redrawing things entirely. That particular Sonic was presumably drawn for that scene, or at the very least not previously used in the comics. Wow really!? I had no idea about the rest of that! Does someone have a comparison? lattely there seems to be much more work revealed of Ken Penders that was traced. Yeah, StH #46 is a good example of this. Several shots of Bunnie, Sonic, Sally and others are subbed in by Spaz. It's pretty glaring if you look at the panel of Antoine's dad talking to King Acorn.